Author R.N. 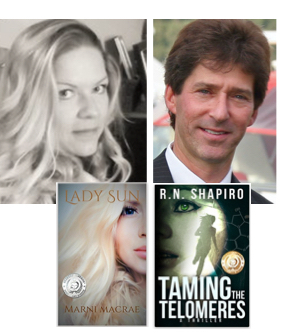 Shapiro was recently interviewed by international award winning writer Marni MacRae, author of the 2015 Readers Favorite Silver award winning romance novel, Lady Sun. MacRae: I could see Taming the Telomeres (TTT) on a big screen, but due to the depth and detail I think it would do better as a series. I think the story has more to it and could be filled in to make quite a few seasons, have you considered pitching it for TV? Shapiro: That’s funny I haven’t thought of T.V., but I am taking steps to work on a screenplay to actually pitch TTT as a movie, I’ve really been encouraged by several of my friends and readers. But maybe I need to think about a T.V. pitch too. Macrae: Well, congratulations on winning the 2015 Readers Favorite Gold Award for best fiction thriller. I know you feel great about that. If the plot concerning Telomere research has real facts behind it, how likely do you think it would be that this research would be released for potential treatment of cancer or other medical benefits? Shapiro: There is no question that researchers all over the world are experimenting with telomerase enzymes and our chromosomal telomeres, the fact that this sort of biological research is happening worldwide is not fiction. And the impact it could have on cell life and even in the field of cancer research is also well-established. When and whether breakthroughs will occur is just a matter of time. How valuable and important a breakthrough will be is a variable that I don’t think we can forecast and that is a centerpiece of my novel. This research can be fantastically important and valuable. Macrae: I understand you hold a few patents yourself, what inventions are they for and what inspired you? Shapiro: I have 18 United States patents all in the field of folding wheel axle technology. My field is fold flat wagons, carts, and baby strollers. I was inspired to design compact convenient products that could stow in the small car trunk or in a closet. My invention design company is Pancake Wheel, meaning everything I design folds flat like a pancake. Macrae: Now that you can add ‘Author’ to your title along with inventor and lawyer, what field has given you the greatest reward? Shapiro: Unfair question. Sometimes being a trial attorney is very rewarding, I’ve had some great experiences being an inventor and designer, like entering a major license agreement on one of my inventions with a great company too. I was stunned to win the gold award for Taming the Telomeres (TTT) but winning that recognition has really given me renewed enthusiasm for my second novel. Macrae: What would you say was the hardest thing about writing Taming the Telomeres? Shapiro: Really everything about it, because I had previously written a non-fiction book but I had no idea how much more difficult writing a fiction thriller was. Every conversation, each move your characters make, and thinking stuff through. Sticking with it once I got halfway through was probably one of the hardest things, when you are at a point that you doubt your novel will be any good. And yes there is a lot of self-doubt in writing. And then also my editor Mary and I did tedious manuscript reviews where we hacked portions out of the book before it was finally published. Macrae: Do you have a next book in the works? If so, does it follow TTT or is it a stand-alone? Shapiro: My second novel follows TTT and picks up just a couple of months after the first novel ends. I knew before I finished the first novel that I had ideas for what would happen in the second book and I’m still working on that, and I’m featuring many of the same key characters, like Amanda, Andy Michaels, Agent Solarez, and David Owlsley, but introducing a bunch of others. Macrae: How similar are you and Andy Michaels, one of your protagonists, since you are a trial attorney like him? I found he was the character with the most depth. Shapiro: Andy Michaels is far too virtuous to be like me! But more seriously it’s a matter of getting ideas for dialogue, having experienced things in my cases either in the courtroom, or in a meeting, that I could twist, turn and fictionalize. I wanted to build a trial lawyer with a conscience, and show how things impacted him and his own family, and show the impact tragedy could have on him. Macrae: Do you have a favorite author who inspired you? Shapiro: John Grisham. First of all I do railroad injury litigation and so did he earlier in his career, I think he is so popular as an author now he doesn’t need to actually try cases anymore, even if he thought it was rewarding. In his first couple novels, he dealt with aspects of the legal system, and used real events that inspired his writing, even though they were fictionalized. His style did have a big impact on me. MacRae: Thanks Rick, I am definitely looking forward to the next Telomeres novel myself.